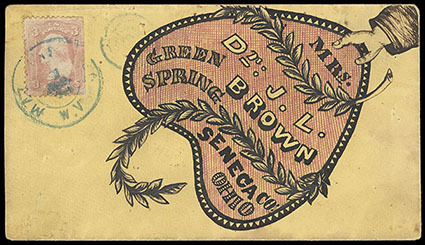 (Hand Drawn) Illustrated Hand Drawn Address Panel, beautiful red and black ink design showing Hand Holding Heart Shape Address Panel, on cover to Green Spring, O. franked with 1861, 3¢ rose (perf flaws) tied by Martinsburgh, W.V. 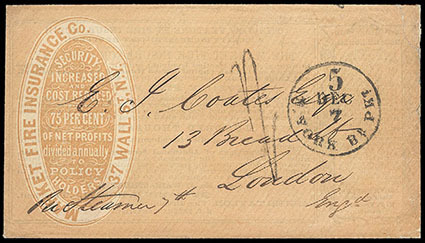 cds and target duplex, Very Fine, wonderful early hand illustrated cover; with 2018 P.F. certificate. Scott No. 65 Estimate $750 - 1,000. 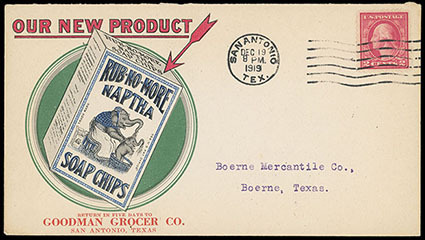 (Home Products) Rub-No-More, multicolored illustrated ad designs on two covers; one showing Naptha Soap Chip Box and other with Palm Beach White Soap Box, franked with 2¢ & 3¢ and tied by 1919 San Antonio, Tex. and 1918 Fort Wayne, Ind. respectively, reverse with additional product illustrations, Very Fine and choice. 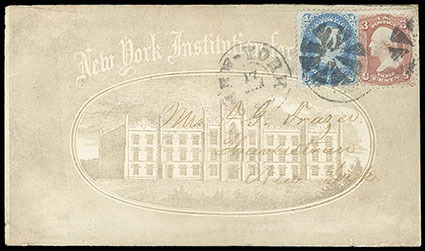 (Institution) New York Institution for the Blind, gray illustrated allover design showing Blind Institution Building, franked with 1861, 1¢ blue + 3¢ rose tied by New York cds and circle of wedges duplexes, Very Fine. Scott No. 63+65 Estimate $150 - 200. 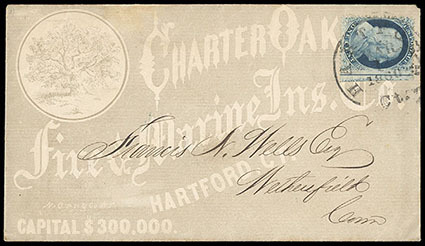 (Insurance) Charter Oak Life Insurance Co., Hartford, Ct., gray allover shaded ad showing Oak Tree, on unsealed circular rate cover franked with 1857, 1¢ blue, type V, gutterline single tied by "Hartford, Ct., Mar 1, 1860" cds, Very Fine. Scott No. 24 Estimate $100 - 150. 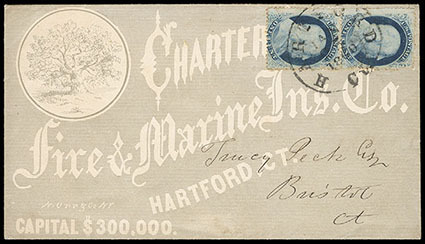 (Insurance) Charter Oak Life Insurance Co., Hartford, Ct., gray allover shaded ad showing Oak Tree, on unsealed circular rate cover franked with 1857, 1¢ blue, type V, vertical pair tied by "Hartford, Ct., Jan 25, 1860" cds. Scott No. 24 Estimate $150 - 200. (Insurance) Market Fire Insurance Co., N.Y., buff allover shade ad cover to London, England, with "N. York Br. Pkt., 5, Dec 7" integral rate exchange cds and "1/-" due handstamp applied upon arrival, reverse with red "London, De 20, 59" receiving cds, cover opens to show an allover insurance advertisement on inside, Very Fine. 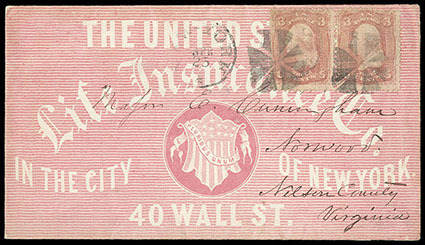 (Insurance) United States Life Insurance Co., pink allover ad design, franked with 1867, 3¢ red, F. grill, pair tied by circle of wedges handstamps, matching "New York, Apr 25" cds alongside, Very Fine. 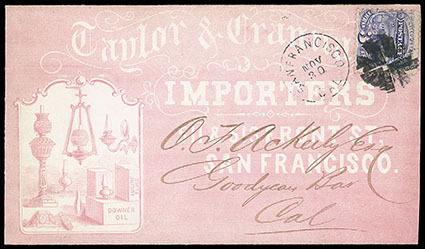 (Lamp) Taylor & Cranna, Importers, San Francisco, pink illustrated shaded ad showing Various Oil Lamps, on cover to Goodyears Bar franked with 1869, 3¢ ultramarine tied by crossroads handstamp, matching "San Francisco, Cal., Nov 30" cds alongside, with agent listing on backflap; slight cover reduction at right, Very Fine. Scott No. 114 Estimate $150 - 200. 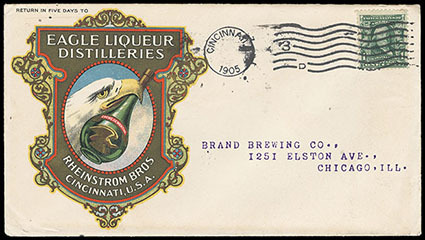 (Liquor) Eagle Liqueur Distilleries, Rhienstrom Bros., Cincinnati, stunning multicolor design showing Eagle with Bottle on 1905 cover franked with 1903 1¢ green tied by Cincinnati, O. machine cancel, multicolor design on reverse showing two additional bottles, Very Fine. 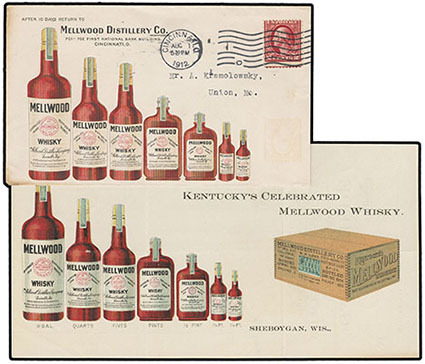 (Liquor) Mellwood Distillery Co., Cincinnati, O., multicolored ad design showing Various Whiskey Bottles, on cover franked with 2¢ red tied by 1912 Cincinnati, O. machine postmark, with original billing enclosure with matching design; minor edge tone, Very Fine and attractive.